Invisible Braces are clearly different and an effective science / technology that has revolutionized orthodontics. Say good-bye to metal brackets and wires, and hello to invisible, removable appliances called aligners. The aligners are virtually undetectable and they go unnoticed when speaking in social situations.Clear Braces can give you that beautiful smile by straightening your teeth without anyone knowing. To ensure the most precise outcome, your orthodontist will use computer imaging to create your invisalign® braces. After taking bite impressions of your mouth, the dentist will use the invisalign® three-dimensional computer imaging system to create a series of clear retainers. The first one will fit your current configuration of teeth. Each successive retainer will act like invisible braces, using gentle pressure to move your teeth to their target alignments. The number of invisalign® trays used will depend on each individual case but the average is between 18 and 30. Each clear invisalign® retainer is removable and worn for two weeks (24 hours a day, except during meals) and then the next aligner is used. This process is repeated until the teeth are in the desired position. The entire invisalign® treatment takes the same amount of time as traditional orthodontic braces. Perhaps the most apparent benefit of invisalign® is that patients can straighten their teeth without anyone knowing. Most adults would rather live with crooked teeth than spend two or more years with the metal braces that they remember from their teenage years. The clear invisalign® retainer was developed to introduce some much-needed aesthetics to the field of adult orthodontics. There are very few problems associated with the invisalign® system. People who fail to wear their clear invisalign® retainer at all times may find that their teeth don’t change position as quickly as they would like. Some people with sensitive teeth and gums may feel some discomfort when they switch to a new aligner in the series. These problems with invisalign® are minor and most patients feel that the benefits far outweigh any problems. Treatment with invisalign® may cost as much as 20 to 50 percent more than traditional orthodontic treatments. The exact figure will depend heavily on several factors, including the extent of treatment required and how many aligners need to be created. Geographic location of orthodontists also affects the average invisalign® cost. It is advisable to inquire about pricing when you are in the process of choosing an orthodontist. At BrightSmile Avenue we love to help our patients reinvent their smile with Invisalign. We’ve written some other articles detailing what Invisalign is and what the process is like. Here we’ve compiled a list of some of the most frequently asked questions to save you some time in your consultation! Invisalign treatment times will vary from patient to patient. In general, you’re looking at about 12-24 months, depending on the complexity of the case and patient compliance. Is Invisalign more expensive than regular treatment? This will depend on your case. 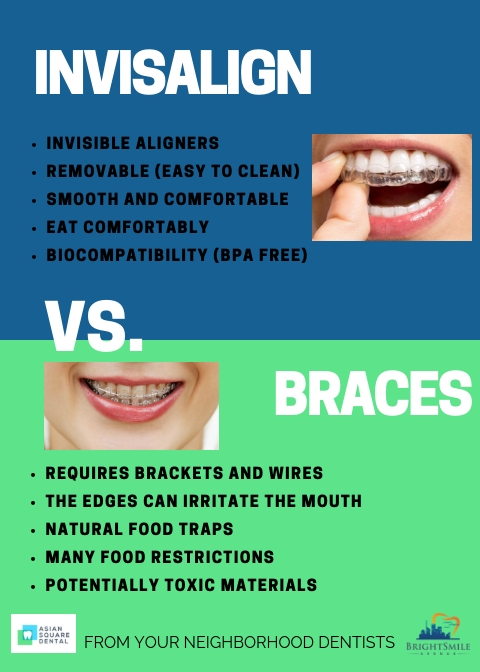 Typically, Invisalign is fairly comparable in cost to other orthodontic methods, but is more expensive than traditional metal braces. We try to make sure everyone gets the best treatment they can afford at BrightSmile Avenue. Traditional wire and bracket orthodontics have a bad history of leaving ulcers, cuts, and sores in the mouth. Luckily, there are no such issues with Invisalign. There isan initial adjustment period where the aligners will feel uncomfortable to wear. This is perfectly normal when introducing any foreign body to the mouth. But there’s no pain. How long do I have to wear my aligners for? 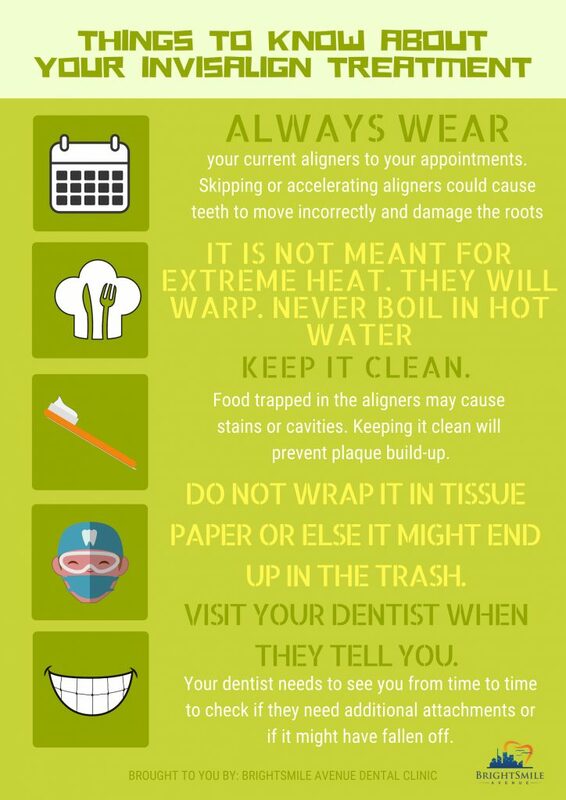 At BrightSmile Avenue, we recommend you wear your aligners for 20-22 hours a day for maximum results. Failure to wear the aligners long enough will result in treatment either not working, or taking substantially longer than necessary. Are there any special cleaning instructions? One of the best things about Invisalign is that you can eat regular food and clean your teeth as normal. The aligners themselves don’t require any special cleaning — just make sure your teeth are clean before you put them back on. What happens if I lose a set of aligners? The team at BrightSmile Avenue will help you get a replacement set as quickly as possible. Unfortunately, replacement Invisalign aligners do incur an additional cost — so keep them safe! Invisalign is an innovative orthodontic treatment that uses clear plastic aligners to straighten teeth rather than traditional wires and brackets. This alone is enough to convince most people to consider Invisalign for their orthodontic needs — but little do they realize that the entire process provides a unique experience that will change how they think about orthodontic treatment. 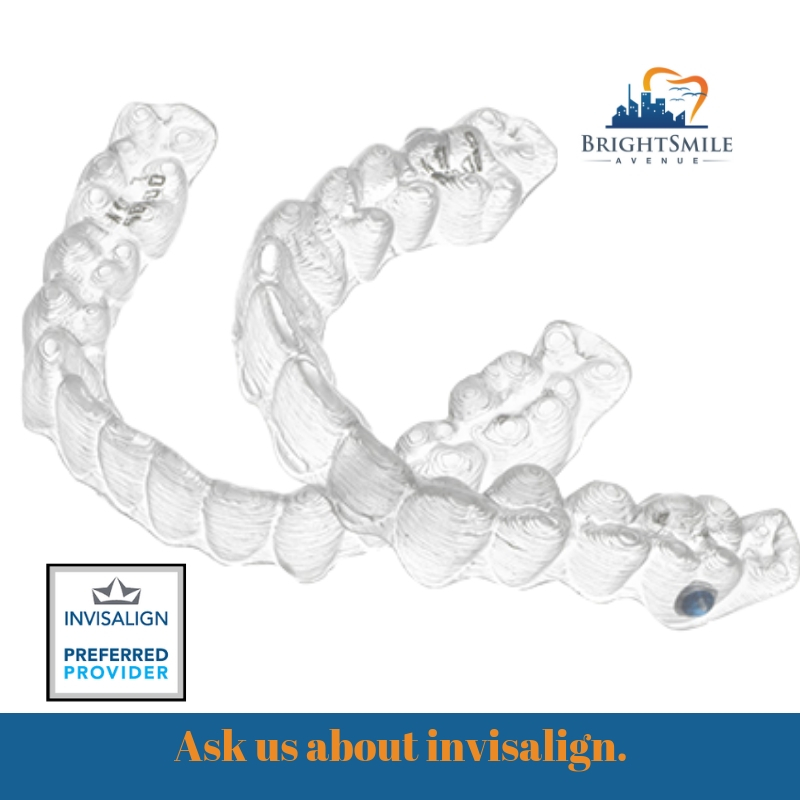 At BrightSmile Avenue, we’re proud to offer Invisalign to our patients. So what is this unique experience? What is the actual Invisalign process? Let’s take a look. Like with any orthodontic treatment, we need to take records of your mouth. With Invisalign, that means taking photos of your teeth and face, getting dental X-rays, and making impressions of your teeth. These records are sent off to Invisalign along with detailed notes. These instructions tell Invisalign things like what the patient’s goals are, and the ultimate desired outcome from treatment. After the records and instructions are sent, Invisalign makes digital scans of the mouth impressions and starts creating digital simulations. These simulations are sent back to BrightSmile Avenue for us to show you how your treatment will go. Using these digital simulations, we can give you an idea of how your teeth will move over the course of treatment, and what the final result will look like. Sometimes the dentists at BrightSmile Avenue might have recommendations for changes to the provided simulation. These changes will be addressed with you first. Pending your approval, the notes will be sent to Invisalign for corrections to the simulations to be made. Once we’ve all agreed on the treatment process based on the simulation, we give Invisalign the go-ahead to make the aligners. 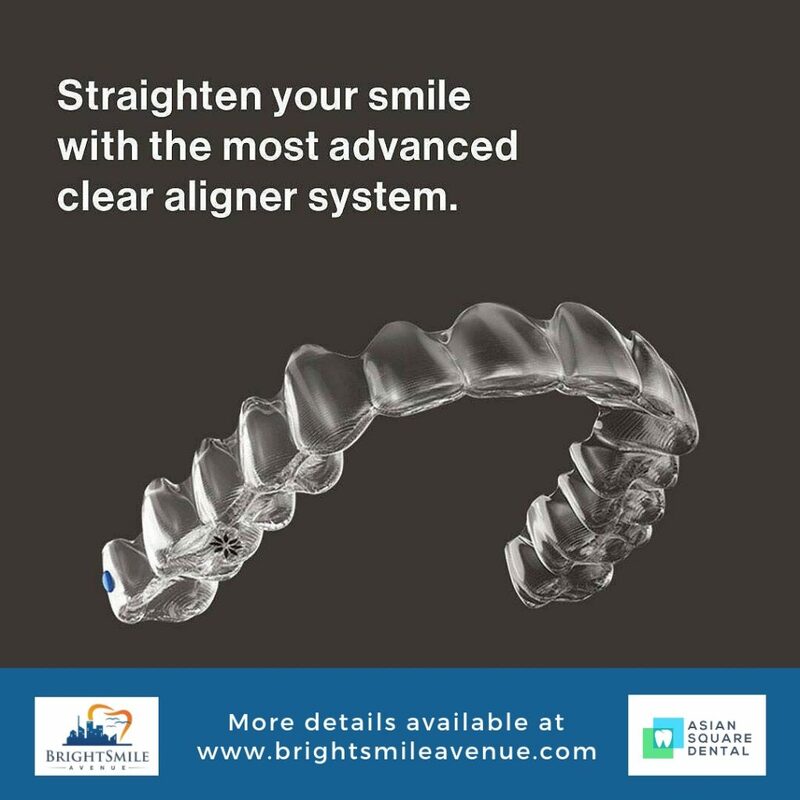 These aligners are sent to us at BrightSmile Avenue. We walk you through the entire process of placing and removing the aligners, cleaning them, and any trouble-shooting you might need. You will wear one set of aligners for approximately two weeks, before moving onto the next set. With each set, your teeth will move approximately 1/10 of a millimeter. Over time, this will push your teeth into the desired position to achieve the proper result. Interested in getting your teeth straightened? Think Invisalign sounds interesting? Contact our friendly team at 6212556 or email us at info@brightsmileavenue.comtoday to book an appointment and find out more! Get your 25% discount now! There’s a stigma around traditional braces that prevents many adults from using them. They’re obvious, they attract unwanted attention, they’re “unattractive”, they’re meant for teenagers — all of these ideas and perceptions influence how many people perceive them. So what can adults with crooked teeth do to align their teeth? How can busy professionals or those who can’t afford to have obvious orthodontic work get treatment? Invisalign is an orthodontic treatment that replaces traditional, obvious braces with removable, clear plastic aligners. Rather than deal with the inconvenience of metal or ceramic wires and brackets, patients use a discrete system of sequential aligners to achieve the results they desire. Traditional braces use a series of brackets and wires to reposition teeth. The brackets are fixed to the teeth, while the wires are used to apply pressure and move the teeth into the desired position. 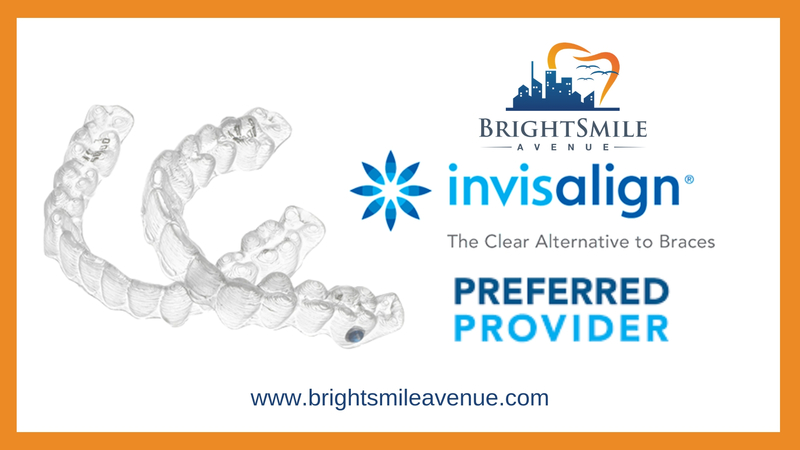 Here at BrightSmile Avenue our Invisalign treatment uses a series of clear plastic aligners to adjust teeth. Each set of aligners is designed specially to fit your teeth, and your teeth only. They apply gentle but consistent pressure to ease the teeth into the desired position. These aligners are replaced every two weeks or so, with each set moving the teeth further along in the sequence towards to the finished outcome. The primary benefit over traditional orthodontic systems is that Invisalign is almost unnoticeable. Many patients report that they’re able to go through treatment with few people realising. This is ideal for professionals, as well as those in positions where obvious orthodontics may be a problem such as actors and models. A secondary benefit of Invisalign is that the aligners are removable. This allows patients to eat whatever foods they want, and clean their teeth normally. It removes the special dietary and hygiene protocols that often make orthodontics unattractive to many people. Lastly, Invisalign uses state of the art technology to scan the teeth and plan the treatment process. Detailed 3D scans are taken of the patient’s mouth, before sophisticated software maps out the course of the treatment. These 3D plans actually let patients see a virtual mockup of how their teeth will look at the end of treatment before they begin. Invisalign cannot treat overly complex cases. The system is best utilized with light to moderate cases of crooked or misaligned teeth. Situations where there is severe misalignment of teeth will still require at least a partial application of traditional orthodontics before Invisalign can be used. Invisalign relies on patient compliance. While it’s certainly helpful to be able to remove the aligners, they must be worn for 20 hours a day to be effective. One of the biggest barriers to Invisalign’s effectiveness is actually patients forgetting to place their aligners back on their teeth after eating or cleaning. This can make the system less than ideal for teenaged patients, or those who simply don’t trust themselves to be diligent with replacing the aligners. If you’re looking to get orthodontic treatment, but don’t want the hassle of traditional metal or ceramic braces, contact BrightSmile Avenue today and ask about Invisalign.